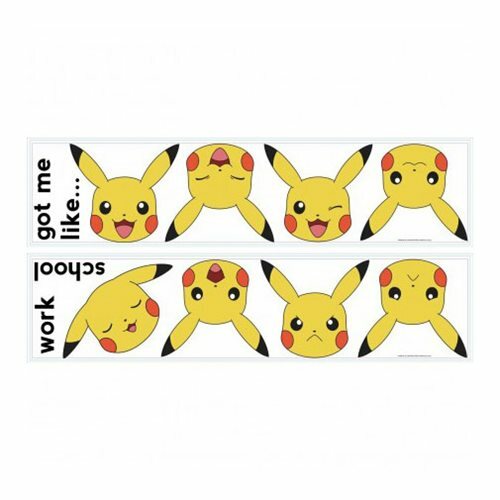 Express your emotions with Pokemon Pikachu Faces Peel and Stick Wall Decals! Happy, sad, confused or excited: Pikachu has you covered. Featuring 12 high-quality vinyl wall decals, add fun and personality to any space in just seconds. Simply peel and stick to any flat surface, including furniture. Our decals are guaranteed removable, repositionable and reusable, so you don't have to worry about damaging your walls or leaving a sticky residue behind. Update your Pikachu in seconds. Just feel it. Swap it. Love it. Decals arrange in sizes from 5-inches wide x 2-inches tall to 9-inches wide x 8-inches tall.